"You aims to replace noisy social media platforms, so why is Zapnito on LinkedIn and Twitter?" When people ask me what Zapnito does and I explain why we are the superior alternative to noisy social media platforms, their next question is "so why do you still use LinkedIn and Twitter to share content?". A valid question and one that can play on this marketer's mind. But we're not 'anti-social', if you will. Zapnito is quite the opposite in fact. We are as passionate about sharing ideas, knowledge and expertise as anyone, if not more so. We do not however see the point in aimlessly pushing content out on Twitter, LinkedIn etc. to a following who may or may not even see it, thanks to feed algorithm changes made by every social platform in recent years. We do however, actively encourage the team to share their original insights on social platforms to broaden their contents' reach. Publishing great articles on relevant topics such as blockchain technology, robotics and artificial intelligence on the Zapnito network will reach all engaged users of the platform but how do we reach a wider community? Share the link to the article on LinkedIn or Twitter and we bring a new audience to our content and our brand. 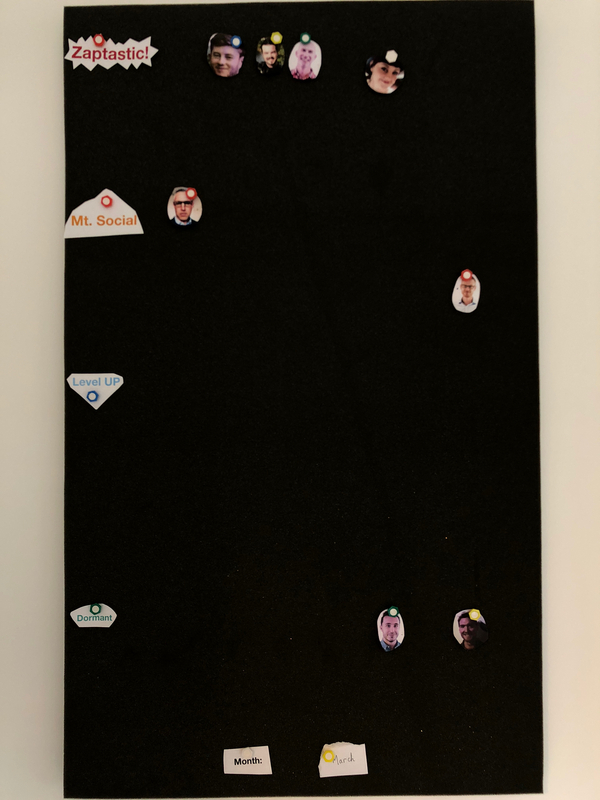 As a fun way to incentivise the team to engage with social media, we use the ‘social media board’, ranking everyone's efforts on LinkedIn, Twitter, and our Zapnito Network. Charles put himself at a disadvantage when he said goodbye to his Twitter account yet he makes up for it on LinkedIn, often being named ‘Zaptastic’ as the person at the top of the board (evidently not in March, however). So, as our social media board shows, we see the value in social media which is why we use it ourselves to widen our reach. But crucially, we also use it to bring people into our own, trusted network, on which you are reading this post. I think with social at the moment, taking the time to target people and places you want to engage with is an important element as well as the general push. LinkedIn is a curious one. There's so much ghastly noise and rubbish like "managers vs leaders", yet with a bit of work you can still find amazing groups and people. Thanks for the response Darren - some great questions there! Yes I think you're probably right, it is worth ensuring your posts are seen by the right people, I'll admit, I just don't have much experience of that yet. You're definitely right about there being far too much noise on LinkedIn (as with basically all the social media platforms I can think of) too and finding people definitely has and will always be LinkedIn's greatest attribute. Sure, so I think it depends on the content itself (in regards to your 'which is the best social platform for our Zapnito content' question). We're now focusing more on sharing our customers' great content than articles we've curated from the wider web, which have been very popular. By channel, there is little comparison when it comes to impressions (Twitter can get ten times as many than our LinkedIn posts) but the CTR is roughly the same, often better through LinkedIn. Which have you found to be the more successful platform for your posts in terms of engagement and/or clicks?